When Grand Theft Auto IV came out, I was swept away. The scope, depth, and scale of the game were almost too much to take in. It seemed like a game in which anything was possible, like a parallel reality, re-created. Three years, two expansions, and countless hours of vehicular manslaughter have provided some much-needed perspective. These days criticisms abound, from sluggish controls and a finicky camera to inconsistent characterization and bloated plotting. But of all of Grand Theft Auto (and indeed, Red Dead Redemption)'s issues, one is perhaps the most overlooked: The crummy, distracting mini-map. That icon-strewn circle in the lower-left corner of the screen is a Rockstar perennial; one could even call it a defining feature of their games. In the real world, have you ever walked down an unfamiliar street while consulting your phone's GPS? You're wandering along, intently following the progress of the little blue arrow on the screen, until you trip over a curb and finally look around, at long last getting a sense of where you are actually standing. Hey, there's a world out here! Returning to GTA IV after a few months away, I realized that more often than not, my eyes were all but glued to that circle in the corner of the screen. I'd be driving through Broker and would find myself following the colored lines on the mini-map so carefully that I wasn't even looking where I was going. A high-speed chase would be difficult not only because of flying pedestrians and hairpin turns, but also because of the intense eyeball-acrobatics required to quickly move between the mini-map to the road. The mini-map's effect on combat is even more pronounced. Enemies turn up as large red dots, and what would have been a tense standoff becomes more of an exercise in dot-removal whack-a-mole. How many enemies are left? Hmm, why not just check my map! Oh, there are three! Blam. Blam. Two down! Hmm, I see the last guy must be hiding in that airplane hangar! Better go kill him. Blam. Don't get me wrong—I had plenty of fun with GTA IV's cover-based combat. But imagine if the (vastly superior, I would argue) combat in shooters like Gears of War or Far Cry 2 had been aided by a mini-map that helpfully pinpointed every enemy's location. The tense thrill of combat would be neutered, and the game would suffer hugely as a result. My eyes were open, my ears perked. A GTA IV shootout had me genuinely engaged for the first time in ages. As an experiment, I tried loading up GTA IV and turning off the HUD and mini-map completely. I found that it made the game significantly more immersive, engaging, difficult, and fun. It didn't quite feel "optimal," and at times the shift was pretty extreme, but all the same I recommend that fans of GTA IV give it a shot. The first thing I noticed was that without the map, I was forced to learn my way around Liberty City. But what I also found was that doing so wasn't actually that hard! Whenever I'd get in a car to head to a new destination, I'd check the map in the pause menu. "Hmm, okay, I have to get to the upper west-side of Algonquin, near the Tw@." (Side note: Yes, these are sorts of sentences this game encourages us to speak aloud.) Once I knew my destination, I drove as I would in a real city—following familiar routes in the general direction of my goal. Liberty City is laid out with such artfulness that it's easy to discern one's location simply by looking around. There's always a landmark, bridge, or body of water visible, and after spending an hour or so getting my bearings in each new neighborhood, I found that I could very easily get around. And while doing so, I was able to get my eyes up and really take in the game's strongest feature: its brilliant setting. L.A. Noire actually implemented a similar mechanic into its partner system; it was possible to have my partner call out the turns I needed to make, freeing me up to take in the sights and sounds of the game's meticulously re-created Los Angeles. Whether that was Rockstar or Team Bondi's influence, it's a promising development. More striking was how much more exciting combat became: wildly intense, visceral, and a bit terrifying. With no map and no HUD, the game's first large-scale shootout in Vlad's bar was as intense as the culminating sequence of a big-budget crime film. Walking into Comrade's, I felt as wired as Michael Corleone sitting down at the restaurant table on that fateful night in The Godfather. When Niko drew down, gunfire erupted with great chaos and bloodshed. In the immediate aftermath, Niko crouched behind a table as I wondered if the coast was clear. Was the armed bartender still crouching back there, waiting? Had I taken him out, or only clipped him? My eyes were open, my ears perked. A GTA IV shootout had me genuinely engaged for the first time in ages. Suddenly, the goon popped up from behind the bar and let off a few rounds, and with a roar, Niko ripped a few shotgun blasts into his chest, dissolving a section of the bar into a cloud of blood-stained, broken glass. The coast looked clear, but I could hear another thug waiting for me outside the door. Shotgun at the ready, I slowly made my way to the door, pulse racing, bracing for what was on the other side. Had I played through that section with the mini-map turned on, the entire thing would have been a mechanical exercise: checking the screen, seeing where the enemies are, fearlessly clearing them out one at a time. Turning off the map and HUD evoked nothing so much as the flawed yet underrated Kane and Lynch 2: Dog Days. Despite a raft of frustrating design decisions and some spectacularly grating lead characters, that game recreated the visceral, chaotic thrill of urban combat in a way I'd previously never encountered. I'll admit that wiping out all of GTA IV's on-screen prompts is a bit extreme. It makes the game much more difficult, particularly in later missions—as it turns out, clearing an entire apartment complex of drug dealers and then escaping a three-star wanted level is pretty difficult without any mini-map advantages! The approach also took some discipline—I'd been hard-wired to expect to play a GTA game a certain way, and it took a few hours to break free of that conditioning. 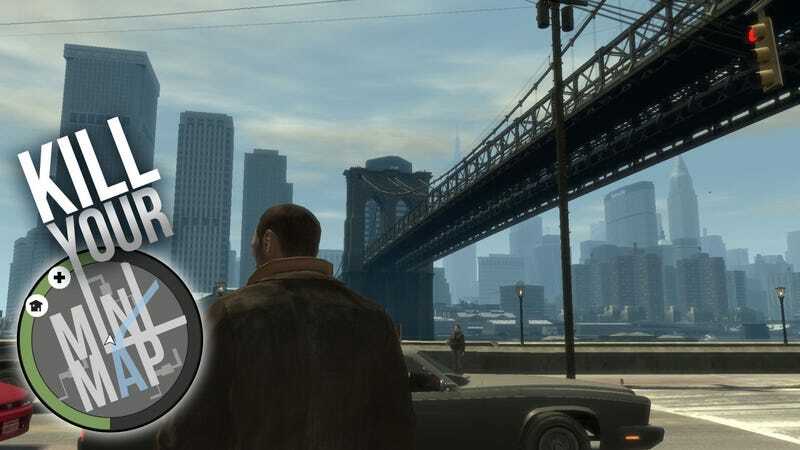 Since GTA IV's launch in 2008, many games have experimented with eliminating HUD-clutter, often with successful results. One of Dead Space's most interesting design decisions was the elimination of the HUD, a trick that made the game much more immersive and terrifying than the comparatively cluttered Resident Evil 5. And Rockstar's own Grand Theft Auto: Chinatown Wars showed that it was possible to overlay a GPS route directly into the game without interfering with a player's view, finally eliminating the need to go back and forth from the mini-map to the game screen. Something similar could certainly work in a 3D Grand Theft Auto. As Rockstar works on Grand Theft Auto V, they would do well to further re-tool their onscreen interface. The best solution would involve a high degree of customizability; perhaps a thumbstick that can bring up the mini-map for only a moment, or the option to turn off enemy locations on the map. With a more organic, less-intrusive system in place, GTA V's open world (rumored to be Los Santos) will become far more immersive. And perhaps more vitally, combat will be much closer to the third-person cover-shooters that GTA IV is emulating. Other changes would be necessary as well, starting with an overhaul of GTA IV's sluggish, much-derided on-foot controls. Given the sharp gameplay improvements that Rockstar San Diego's Red Dead Redemption showed over GTA IV, it seems safe to say that Rockstar North will be making further refinements to their next mega-release. But it'll be a little while before GTA V comes out. In the meantime, try firing up Niko's big adventure, turning off the mini-map, and losing yourself in Liberty City all over again.